Well, this has been an interesting few days!!!!! We’ve seen a lot of political activity lately, plus natural disasters like fires in the West and flooding in areas farther east, the tragedy in Orlando and other areas of the world and now Britain’s exit from the EU. Personally, I have been through a difficult experience with the plumbing company I hired to do some work for me on my home, updating some of my plumbing. I told you that the top would be a bit tricky as I was not quite sure what I was going to do. I had the idea but hadn’t gotten to the specifics yet. 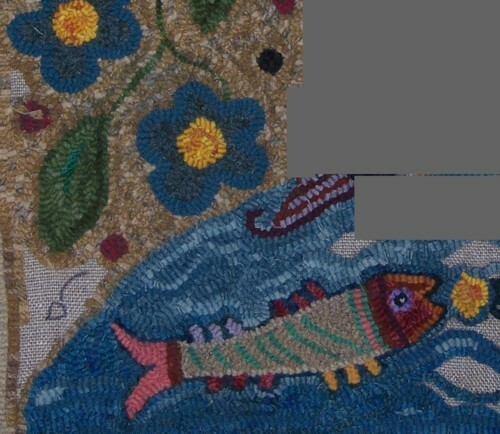 Also, I was going to use a blue for the sky (sky above, water below) and thought that I could use some of the other blues used in the flowers and the fishpond. I thought that would be best as I did not want the sky to stand out too much, just as I did not want the pond to be too dominant. So I have hooked, pulled out and re-hooked parts of the sky with 4 of the wools I used in the pond and flowers.!!!!!!! None of them looked right! So…..I found a blue plaid that was not in the rest of the rug at all and was rather dull and it seems to work! Hooray!!! I am getting close to the finish line! 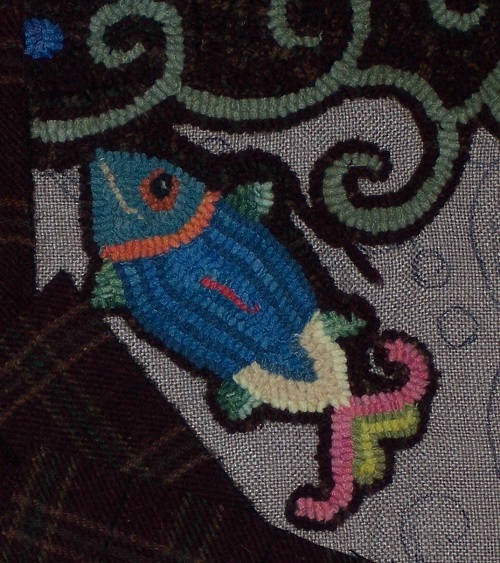 I said that this piece was part of a challenge on Rug Hooking Daily where we were to take a song or a character from a literary work, etc and interpret it in our own way. Since I was doing an experiment with this rug anyway, it actually fit in with the title of a popular song from 1976 by Leo Sayer. (YMMFLD) The center figure is a Medieval illustration that I first saw many years ago in one of my Dover books. As I’ve said, I am combining simple flowers often seen on bright Mexican, Czech and Italian pottery with the Medieval figure and adding Ancient Art used to illustrate the sky above and the earth and water below. I thought this combination would work well with the plaid I had chosen for the background. 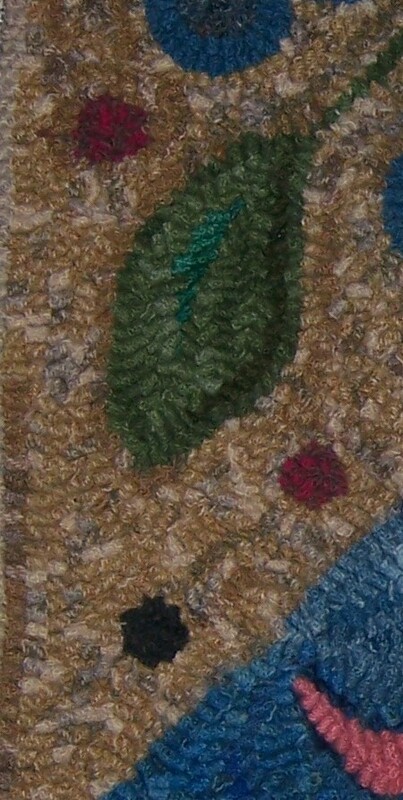 However, I did get some leaves done and added my initials as vines on the lower right center of the rug. I have been trying to place my initials on my rugs in different, fun ways and I find it very satisfying!!!! I used to either just put information on the rug back or place my initials in the lower right or left…but it seemed to me that I should be more creative!!! 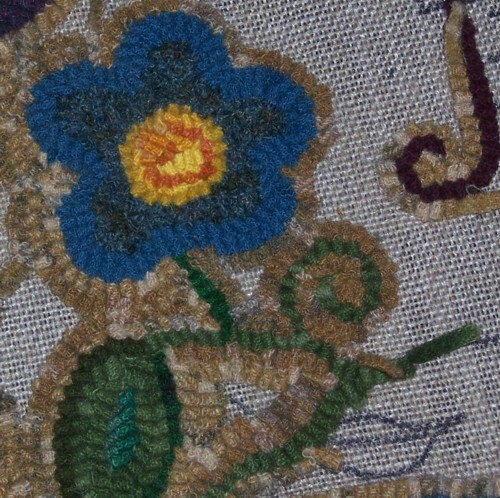 After all, I spend a lot of time experimenting and finding different things to hook that are not like other rugs being hooked today…so why not carry that difference over into my initials. 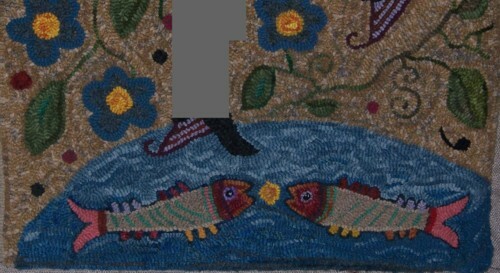 I know that on Rug Hooking Daily, there is a Group called the Ten Minute Rug Hookers who try to hook at least 10 minutes every day!!! 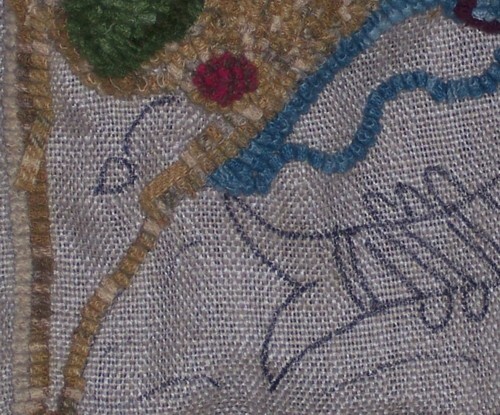 I know I have just been able to sit down for a few minutes of hooking on days when I am really busy…but I usually have a couple of hours to hook on most days. Hopefully, with the cool weather, I can get a bit more gardening done and then zip (or hobble!!!) inside for some quiet hooking time. I have come to another tricky part of this rug! 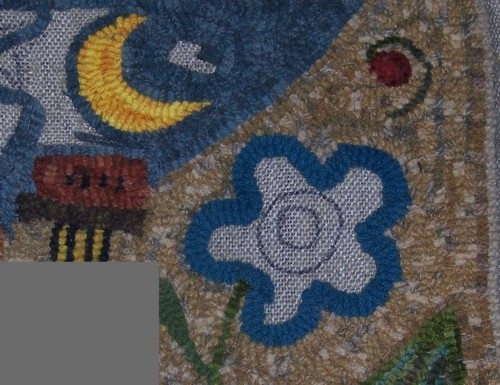 The blue wools at the bottom of the rug need to anchor the space but not compete so much with the blue flowers that they take attention away from them. 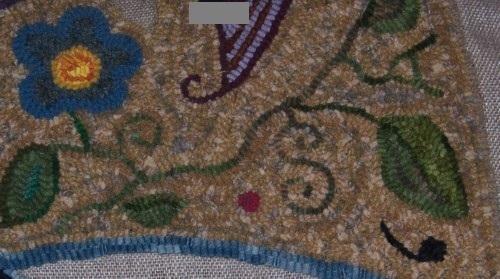 The center design, the blue flowers and background in the center area of the rug need to be the first focus…the top and bottom of the rug need to be strong but not too “showy”. This means that I have to test blues as some wools look fine until they are hooked…then they don’t look right when I stand back and look at the whole rug design. I was going to use several wools in a curvy pattern for the pond ripples but found out that it was just too much contrast. So I am using 2 wools-one mottled wool for the top and a little darker, less mottled one for the rug bottom. 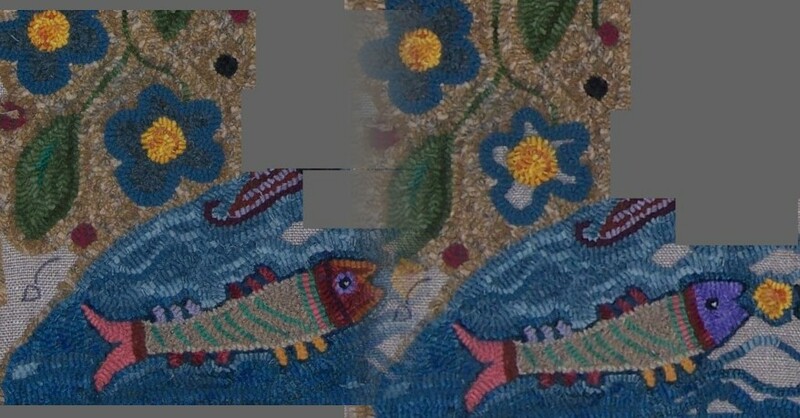 The fraktur-style fish are tricky too as they need to stand out a bit from the water but not draw undue attention to themselves!!!!! 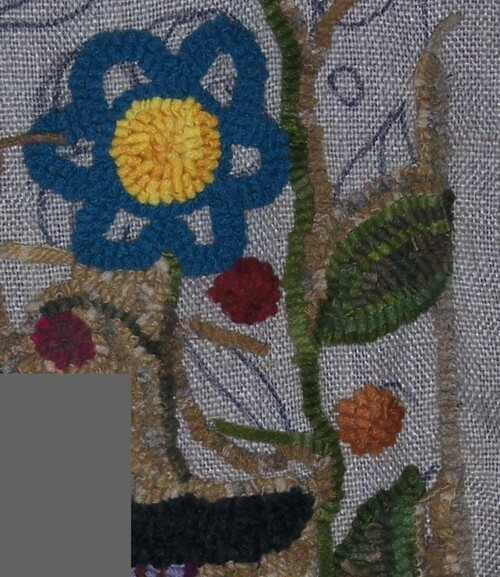 These decisions are what makes rug hooking such fun for me!!!!! I never know just how my finished rug will look…and each one is a surprise because I don’t colour-plan my rugs in advance. I’ve said before that I pick out a couple of colours I like and decide on either a dark or a light background. For this rug, I could have chosen any cream/tan plaid that was rather subdued but I wanted to try out this plaid. So I designed my rug to go on this background. I do recommend that, if colour is important to you, that you take photos and put them on your computer as well as changing rooms to look at the work in a different light. I know that helps me as I have a lot of glare in my hooking room. I have not yet purchased blinds to adjust that glare so I deal with it by changing rooms and taking photos! I hope those of you who want to step out of your comfort zone for a bit won’t be afraid to try taking ideas and inspiration from a lot of different sources and gathering them together in a hooked piece! It really is fun!!!!! 🙂 Maybe an art deco design with a Pennsylvania dutch fraktur, a tree from a vintage Christmas postcard and a bird drawing from an antique children’s book. Or a motif from a carved wooden chest put together with a design from an antique sampler, a deer from an old tapestry, a little dog from a 17th century painting and an illustration from a vintage butterfly book. I decided to hook this design at the bottom because it goes along with my little story. It shows how we can make a misstep when we are mesmerized by something in the distance and are not paying attention to what we are doing!!! !